Foodies on the lookout for new dining destinations can look forward to an exciting new gustatory adventure right in the heart of Pasig City. Starting September 13, the metro's favorite food trucks will be parked at Capitol Commons, the newest residential and lifestyle destination from developer Ortigas & Co. The Food Truck Park in Capitol Commons will allow diners to experience the new trend of mobile food catering and enjoy unique food offerings from the Philippine Food Truck Association. The culinary adventure includes fusion comfort food from Hungry Rover, kebabs and wraps from Shawarma Bros., homemade burgers from Big Bite Avenue, and unique gelato flavors from Mio Gelati, among others. 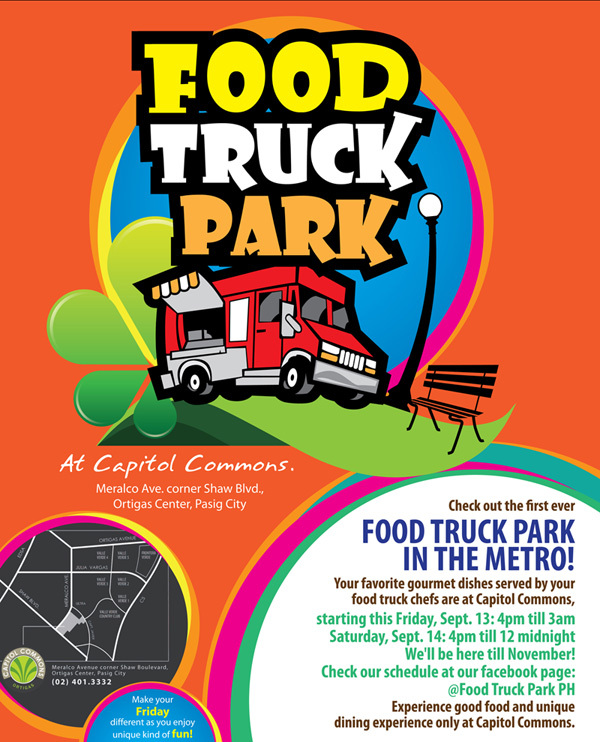 The Food Truck Park will be available starting September 13 at the Capitol Commons Park. Capitol Commons is located at Meralco Avenue corner Shaw Boulevard, Pasig City. Capitol Commons is a new 10-hectare mixed use development from Ortigas & Co. For 80 years, Ortigas & Co. has been developing masterplanned communities that have thrived over time. It counts in its portfolio some of the country's best residential, business and commercial developments. It is the company behind Metro Manila's well-loved shopping destination such as Greenhills Shopping Center and Tiendesitas, as well as longstanding residential developments like the Greenhills Subdivisions, Greenmeadows and Valle Varde. For more information, call 401.3332, or visit the Capitol Commons Facebook page and the Food Truck Park Facebook page for schedules. Tags: Big Bite Avenue Capitol Commons food foodie foodtruck foodtruckparkph Green Bulb Productions Hungry Rover Mio Gelati mobile catering Ortigas & Co. Pasig press release Shawarma Bros.